Search Results for "freezing cold woman"
Nice sick grandmother wearing blanket coughing, freezing cold. Unhappy woman aged talking pills. Indoors. Close-up. Sore throat. High temperature. Sickness. Freezing woman feeling cold outdoors trying to keep warm shaking and shivering wearing hat and gloves outside hiking on hike. The woman is freezing. A woman hides from the cold. Attractive young woman shivering in freezing cold, stormy bad winter weather with rain drops under cloudy sky SLOW MOTION. Gorgeous ill Ukrainian beauty wearing blanket on shoulders sitting on sofa in room. Nice young Slavic woman taking pills, freezing cold. Indoors. Treatment. Close-up. 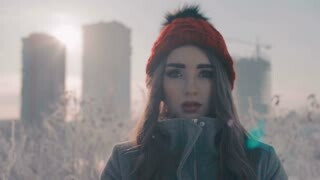 Attractive young woman in a freezing cold and windy storm with a colorful rainbow in the cloudy sky SLOW MOTION. Charming young Ukrainian woman wih dark hair freezing cold, measuring temperature. Portrait of smiling ill Caucasian girl drinking hot tea. Indoors. An old woman with a black umbrella and rain coat in a bad weather freezing cold winter storm as snow and hail fall around her SLOW MOTION. A beautiful old woman wearing a winter rain coat and hood staying warm in a freezing cold winter snow and hail storm SLOW MOTION. An elderly woman wearing a thick warm winter jacket and hood standing in a freezing cold winter snow storm SLOW MOTION. An old woman wearing a thick warm winter coat and hood standing in a freezing cold winter snow storm SLOW MOTION. A woman in a warm winter coat walking as snowflakes and hail fall in a freezing cold winter storm SLOW MOTION. Beautiful woman freezing in autumn park. Young female model warming her hands in the forest. Autumn cold. A woman wearing a winter rain coat and hood walking in her garden in a freezing cold winter snow and hail storm SLOW MOTION. Old lonely ill Caucasian woman sitting on sofa in room of big house near table with colored drugs. Grandma in blanket freezing cold. Indoors. Coziness. Young woman blows snow at camera.